If the idea of browsing gift ideas on your phone while waiting for your morning coffee sounds familiar, you’re not alone. This holiday season, shopping moments will replace shopping marathons. Rather than rely on day-long mall marathons, Canadian shoppers are now turning to their mobile phones at moments throughout the day, all season long. 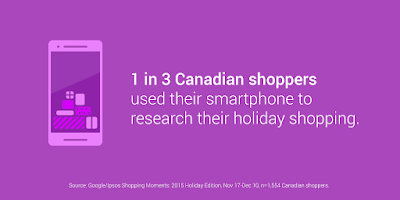 * In fact, in the past two days, 1 in 3 Canadian holiday shoppers used their smartphone to search for products and services. But with holidays less than 2 weeks away, Canadians have completed less than half of their holiday shopping! 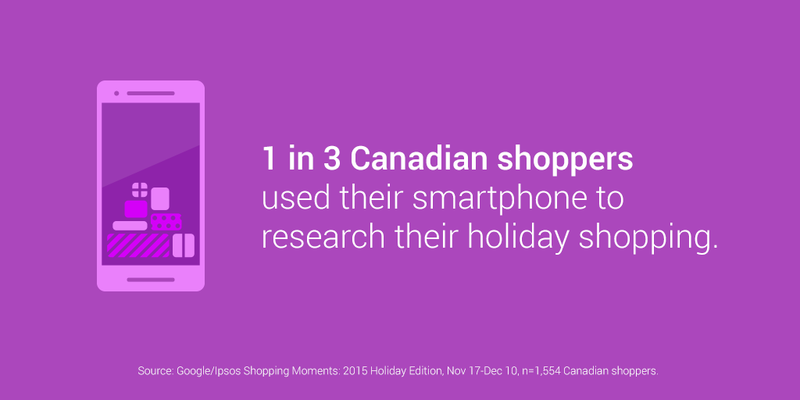 We worked with Ipsos to survey Canadians on how they’ve used technology to shop so far this holiday season. And today we’re sharing the three trends that are impacting this year’s biggest shopping season. Shopping marathons have become shopping moments. Shopping marathons have been replaced by small shopping moments that can happen any time of the day, as shoppers turn to the nearest device when trying to decide, find, or buy something. Thanks to growing digital shopping options, every day can be a shopping day. This year, sixty-seven percent of Canadian holiday shoppers have conducted an online search for a holiday product or service, and 72 per cent have made a website visit as part of their holiday shopping. And this year, online shopping never sleeps! While in-store shopping peaks between 2pm and 5pm, desktop and smartphone searches peak later in the evening between 7 – 9pm. In fact, 36 percent of visits to retailer websites happen between 7pm and 6am. Mobile search is influencing purchases more than ever. Smartphones have become the go-to for all steps in the path to purchase, from inspiration to research to purchasing. 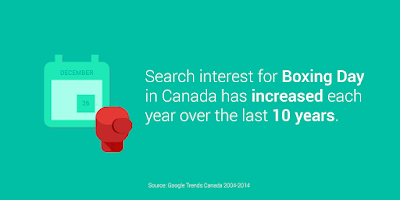 Globally, we’ve seen shopping-related searches on mobile have grown more than 120 per cent year over year. Canadians aren’t just using smartphones to make purchases, they’re also using them as a personal shopper to locate products in nearby stores, look at reviews while in-store, and more. Sixty percent of shoppers who used their smartphone to search for products and services followed through on a purchase. Apps have become an additional toolkit for shoppers with 44 per cent of Canadians using mobile apps as part of their holiday shopping experience. No matter how you’re shopping, have a happy holiday! This entry was posted in Google Canada Blog and tagged Google Holiday, mobile, retail on December 15, 2015 by Aaron Canada. This entry was posted in DoubleClick Search Blog and tagged Ads, Bid strategies, DoubleClick, real-time, retail, Search on October 15, 2014 by Justin Huskamp.